I want to recognize Brendon Beatrice and Tom Carran as service stars as a result of their selfless service during the Leaf Raking project. 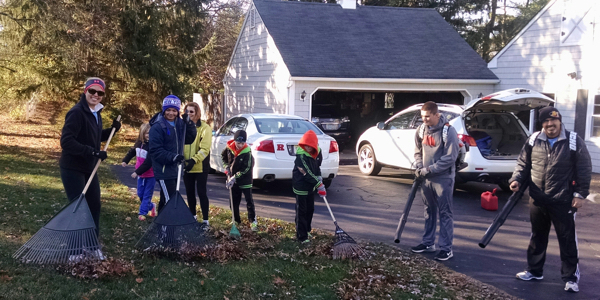 After processing the leaves at our assigned Bridgewater home in 30 minutes, one volunteer in our group mentioned that she had many leaves stacked up at her house so we volunteered to tackle the leaves at her house. We did not know that she has many oak and other trees on her property and had a huge pile of branches that needed to be size reduced to fit into her car for a trip to the dump so it was quite a project. However, we were not deterred. Brendon with his chain saw tackled the wood pile while Tom with his industrial leaf blower tackled the front yard and I blew and raked the backyard. Brendon then loaded all of the cut limbs into Diane’s car. 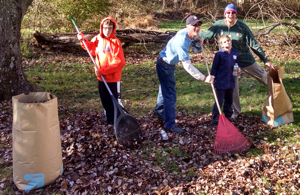 Tom, the homeowner, and I hauled the blown leaves from the front yard to the rear of the back yard. I had to leave after 1.5 hours for an appointment but Brendon and Tom were still going strong. When I left, the homeowner was in tears and said that she has never known such kindness. 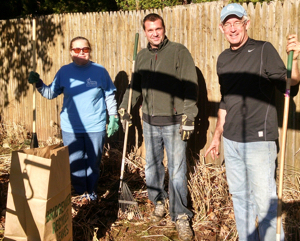 The homeowner provided drinks and cookies for us and said that her front yard had never looked so good. 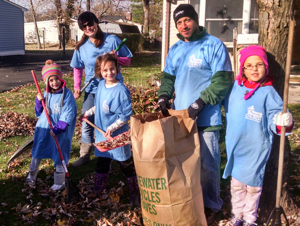 NBRC members serving both members and non-members makes our Church great.